Aspen Santa Fe Ballet represents a strong and resilient brand in the contemporary ballet genre. The troupe's vivid personality, athletic dancers and innovative repertoire position it as a highly in-demand touring group. The nation's most prestigious dance venues regularly engage ASFB: the Joyce Theater, Jacob's Pillow Dance Festival, White Bird Dance, and TITAS-Dallas. Festivals such as "Fall for Dance" at New York City Center and the Kennedy Center's "Ballet Across America" program the company. Deepening the existing ‘presentation’ relationship, The Joyce Theater Foundation, Wolf Trap Foundation for the Arts, Dance St. Louis and the American Dance Festival have all co-commissioned new works in collaboration with ASFB. A company on the move, ASFB's evolving repertoire sparks audience curiosity and provides presenters with fresh, vigorous content. ASFB's track record in discovering new choreographic talent indicates an ability to not only anticipate but indeed form the future of dance. Year-round availability provides optimal flexibility to accommodate booking schedules. The well-traveled touring unit – 11 dancers, 2 technical crew, 2 artistic staff – scales flexibly between small and large venues. Versatile repertoire, ranging from accessible to sophisticated, enables ASFB to tailor and adapt programs for varying communities and audiences. School performances, outreach activities, and master classes are available on tour. Ranging from the accessible to the sophisticated, Aspen Santa Fe Ballet's repertoire resonates with eclecticism and energy. 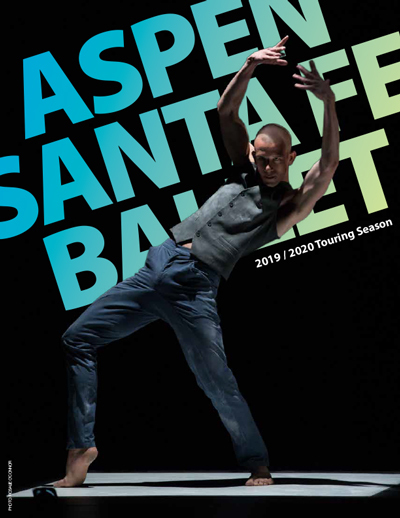 View Aspen Santa Fe Ballet's active repertoire here.